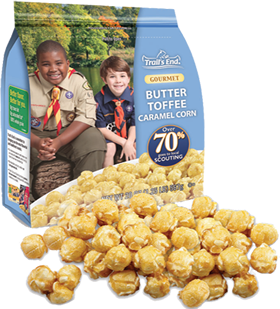 Fall is our favorite time of year, in part because we can get more Boy Scout popcorn. If you've never tasted it, you don't have to take our word, just try it. Scouts are your best investment in our community. They are your next generation of leaders. But they don't ask for hand-outs. They offer you something your entire family will enjoy. Do you have a troop at your school or parish, or a Cub Scout living on your block? Be sure to buy from them so that your investment stays with their unit. Your money will also stay local, and be shared among all of the area scouts. What Happens To Your investment? Scouts go to camp, earn merit badges, learn life skills, and become leaders. Your money helps to purchase scouts' uniforms and send them to camp when they need a little assistance. So What Is Your Investment Buying? Popcorn! and more new flavors this fall!